The Adder X-DVIPRO-US is Adder's second generation extender to transmit both full DVI video as well as USB over a single CATx cable. The AdderLink X-DVI PRO allows users to distribute control of any computer which uses DVI video and USB. The X-DVIPRO can deliver perfect 1080p digital video at distances over 50 meters (164ft) and resolutions up to 165 MPixels per second (e.g. 1920x1200 @ 60Hz or 3840 x 2400 @ 17Hz). In operation, the X-DVIPRO is truly plug and play, delivering full EDID data from computer to screen ensuring your hardware is always setup to deliver optimal display performance. The AdderLink X-DVI PRO also delivers bidirectional USB (low speed / full speed) data allowing you to extend any USB device on the same CATx cable. This makes the X-DVI PRO perfect for distributed workstations where you want to reduce environmental concerns such as heat and noise. A typical example of this would be post production suites. By centralizing your workstations, you can also extend operational life-span by ensuring optimal temperature control, and minimal physical disturbance. CD audio quality (stereo channel 16 bit sampled at 44.1kHz) is available to transfer stereo audio from local to remote for Line Out. 8 channels of HDMI audio are also supported with sample sizes of 16, 20 or 24 bits up to 192kHz (simultaneously with the analog jack audio). The AdderLink X-DVI PRO transmitter can be powered directly via the USB link, reducing cable clutter. If you prefer, a mains power adapter is also available if the USB port has insufficient power. 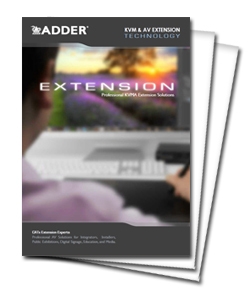 Adder Technology have a well-earned reputation for creating products that perform well and stay the course. The X-DVI PRO extender units are no exception and feature tough metallic enclosures to ensure they can easily withstand everyday treatment. The internal components and external connectors too are selected for their reliability in addition to their performance characteristics. The ADDER X-DVIPRO supports fully transparent USB connections and is able to support all common hardware platforms including PC, Sun and MAC and their associated peripherals. AdderLink X-DVI PRO extenders are delivered in a zero config state so you can plug them in and start working with them straight away. There's no need for drivers or software to be installed. X-DVIPRO is also known as X-DVIPRO-US, X-DVI PRO and X-DVIPRO-USA. We have the Adder X-DVIPRO-US in-stock and ready to ship (no lead time). Sorry about the delay on this. For the most speedy responses on lead time, please feel free to contact your KVM Switches Online sales representative directly.